And yet another carnival I failed to complete... It's a good one though, Fathers in Children's Books was the theme and it takes place at Susan Writes. 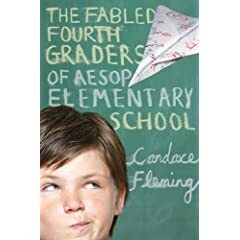 All the way through The Fabled Fourth Graders of Aesop Elementary School by Candace Fleming I kept thinking about what a great book it would be to read aloud! It is just what I look for in a book... short, engaging, and it had some great morals to learn. What I loved, loved, loved about this book were the characters. Not only did they have cute names (librarian Ms. Paige Turner, Missy Place a student who loses everything) but I could see my students feeling a kinship with them. Although, I think they were meant to be "bad seeds" at their school, to me they seemed just like every fourth or fifth grader I have ever met. The book reads like several short fables each containing a moral every student should hear. However, there is another story going on as well. The story of the student's fourth grade year at Aesop Elementary. March was testing time at Aesop Elementary School. Time is often wasted on things of little consequence. The newest installment of The Mysterious Benedict Society is here and it is GREAT! The Mysterious Benedict Society and the Perilous Journey by Trenton Lee Stewart is the sequel to The Mysterious Benedict Society. It lived up to all my expectations. It has been a year and the foursome, nicknamed The Mysterious Benedict Society, is back together. They have planned a reunion and think that they will all be meeting at their faithful adviser Mr. Nicholas Benedict's home. Little do they know when they arrive they will be met with a great adventure! It is part planned adventure arranged by Mr. Benedict himself and part an unexpected adventure due to Mr. Benedict's twin brother Ledroptha Curtain. Mr. Curtain and his old crew, now renamed "Ten Men," are up to their old ways and no one is safe. Perilous Journey is an understatement. This book had more twists and turns than Lombard Street in San Fransisco. I was literally on the edge of my seat the entire book. As with the first book, it is quite long. It took me, well let's just say awhile to finish. I can't say enough good things about the plot of this book! It is just so engaging and fun! I love the puzzles the children are trying to solve and find myself trying to solve the puzzles before the kids. I never succeed. I must admit, I can never give these books a full 5 stars. There is NO WAY on God's green Earth my fifth grade students could hang with the vocabulary in these books. I often found myself looking up certain words. I am all about trying to encourage students to extend their vocabulary, but there is no need use words even the teacher needs to look up. (And I am not just talking about one or two words) There is nothing in a the world that will turn off a kid to a story faster than vocabulary they do not understand. I bet listening to these stories on recordings would be great to solve this problem. Again, this book, as was the first book, too long to read aloud to a class. All this being said, I recommend this sequel to all adults who enjoy a little puzzle and a lot of adventure! Oh, I almost forgot... the ending was left wide open for a third installment! YEAH! 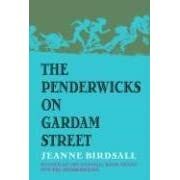 It took me awhile to get to The Penderwicks on Gardam Street by Jeanne Birdsall, but I am glad I did. I kept seeing it but passing it up, I think because I was afraid it would not impress me as much as The Penderwicks. I must say that it impressed me MORE! I really liked the flow of this book better than the first. Although it still had that feel like a book along the lines of Little Women or Laura Ingalls Wilder, but I felt like the characters were a little more modern. I like how there aren't many references to the time period in which the story takes place. It makes me feel like the book can withstand the test of time. In this second book, Mr. Penderwick is urged to look for a date. The whole story does not however, hinge on Mr. Penderwicks dating life. Each daughter kind of has her own story going on this time. I like to see how each daughter is growing. The book doesn't assume nothing has changed since last we read. New characters are brought into the mix and old characters are revisited. I am very anxious to see how these new characters and old characters may or may not come together in following books. One piece I was a little disappointed with was the ending. It left nothing to my imagination. I felt as though, although I would never want this to happen, the series could have ended right with this book. This book again satisfied my need to read a good book that takes me back to listening to my grandma read Little Women to us. I think I would be taking a risk assuming EVERYONE in my class would enjoy this book as a read aloud, but I know I could recommend it without worrying one bit that they wouldn't enjoy the story. I always DREAD talking about "Goals." I know, I know. I'm a teacher, I should be all about goals. I am, but I am also a perfectionist so I am always I afraid I won't achieve the goals and "someone" will be disappointed. Again, I know, I know... "No one will be disappointed, you'll only disappoint yourself." Well, isn't that enough? I don't particularly like the feeling of disappointment. Are those goals? Well, they are for me. I am almost positive I can do them all, except the reading one. I know I can do it, but I am not sure if I will. When I should be writing about the book I recently finished, I am instead messing with the settings on my blog. Please note my new "Noteworthy Blogs" section. I had this before, but Blogger just came out with a way to make a Blog Roll that not only shows the name of blogs, but also the last entry title and last updated date and time. It also shows an icon for the type of blog they are using, and there is an option to put a snippet of the last entry, although I didn't choose to use this feature. All I had to do was import from my Google Reader which blogs I wanted listed. Blogger does the rest! LOVIN' IT! PS- Now I feel like a liar. I just looked and my blog was doing none of the things I claimed it could do??? I did decide to let go of the "Last entry title" because it was taking up too much space, but now I am not seeing anything? I will work on this, but I swear it was there and it was cool looking.